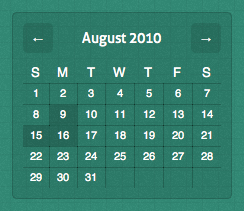 I recently decided I wanted to add a calendar of blog entries on my personal site. Luckily, ExpressionEngine has a tag for that, the Calendar Tag. The functionality that I wanted was a little bit different from the two examples in the EE user guide. 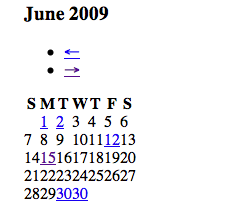 I wanted to show a calendar by month, and link the days that had an entry to that specific entry. We just need a little PHP to fix that. 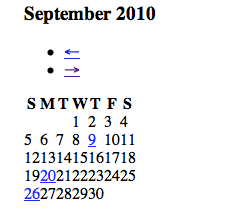 Make sure you allow PHP on output for the calendar template. So the downside is that if there are multiple entries on a single say, the day links to the first entry, but I can live with that. Basically I am just going a GET request when a previous or next arrow is clicked, appending it, sliding the old month out of the way, and sliding the new month in place. I'm not going to go through step by step, but I can certainly answer any questions in the comments if you have any. You can see the final version in the sidebar of my site.